Gurgaon-based Twyst, a startup that assists food & beverage (F&B) outlets to acquire and retain customers through deals, has raised an undisclosed amount in seed funding from Taplow Executive Search's Rohit Bhatia, serial entrepreneur Sunil Nikhar and other investors. Better Labs CEO Vaibhav Domkundwar and former Bessemer Ventures director Siddharth Nautiyal also put money in this round, as per a press statement. Twyst, which is run by Gurgaon-based Twyst Technologies Pvt Ltd, will use the funds raised to expand operations to other Indian cities and for acquiring more customers. COO Rahul Chakraborti said the company is launching the new Twyst app; it will go beyond loyalty rewards while continuing to focus on the retail space. Twyst assists merchants to set up and run targeted reward programmes to drive new and repeat customers by incorporating loyalty programmes into the marketing mix. 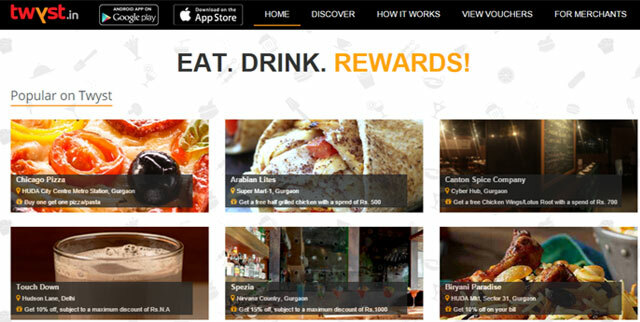 Its customer engagement platform provides users with personalised recommendations of dining outlets in the vicinity. Users are rewarded with vouchers and deals if they frequent certain places. Twyst claims to have a user base of over 150,000, of which 45 per cent are repeat users. It competes with the likes of Crownit, Clozerr and Paymango. Crownit had recently secured $5.5M in Series A funding from Accel Partners and Helion Venture Partners. Paymango, founded by former CTOs of PayU and Zomato, raised angel funding of $234,000 in June this year. The Twyst app is currently available on Android and iOS platforms. The company is aiming to clock GMV of Rs 50 crore, said Abhimanyu Lal, CEO of Twyst. It has tie-ups with over 300 F&B outlets across Delhi NCR. Twyst was launched by Lal, Chakraborti and Arjun Rajappa in March 2014. Before starting the company, Lal worked as eBay's marketing head while Chakraborti and Arjun worked with Yahoo and Microsoft respectively.